If you thought Common Core State Standards were bad, look out! Here come the new social-emotional standards to complement Common Core—because nothing says children have feelings more than benchmarks! Today’s Common Core State Standards are aligned to high-stakes testing that closes schools and pushes good teachers out. Of course, many parents have not been happy with Common Core—so much so that it has been likened politically to a “third rail” topic with the Democrats. The Republicans seem to have dropped it from their platform as well. So don’t strain your ears listening for those words on the campaign trail. But according to Education Week, there is an effort underway to produce standards to create caring, nurturing children. The Every Student Succeeds Act includes the push for such standards in their reference to the “whole child” and as an “additional indicator” to accountability. Many so-called education experts, who believe in Common Core, woke up to the fact that the standards didn’t factor in the social-emotional needs of children. So, voila! Now, children will have to act a certain way to reach behavioral standards. But how do you standardize emotions? And haven’t good teachers always worked to understand and help children with their feelings and conduct? Must these now be measured–and mandated? It is also worrisome to hear statements in regard to states creating these new social-emotional standards, like that of Roger Weissberg who says in the Ed. Week article that creating such standards will tell them “how to align from the statehouse to the classroom.” Weissberg is the chief “knowledge officer” for the Collaborative for Academic, Social, and Emotional Learning (CASEL), the nonprofit group considering the social-emotional standards. This alliance sports a lot of individuals with clout when it comes to public schooling. Having state standards helps inform districts, central offices, and boards of education what might be prioritized. They can provide more guidance and help inform schools. Inform schools about what? They don’t know the children. They don’t work with them. In cash-strapped school districts where they are laying off teachers, how much money will go into the new materials, and the endless hours of so-called professional development? I read where show-in-tell was being suggested as a good thing to promote listening. What a revelation! I bet you never heard that one before. And, the use of technology is already being touted as having the power to “engage the disengaged,” and that there will be an “emerging marketplace,” among other things. (See, Social-Emotional Learning Would Benefit From Tech Innovations). Here is a report New Vision for Education: Fostering Social and Emotional Learning through Technology, prepared in collaboration with the Boston Consulting Group. The standards will be linked, by the way, to Response to Intervention which is controversial by itself and thought by some to keep students from special education services. So, why does the school district, or the state for that matter, have to become involved with a child’s social-emotional behavior or development? And while the new standards are supposed to be “developmentally sensitive,” what happens when a child reacts to a tough period in their life—a divorce, or death in their family? If they act out or display behavior different from the chosen standards, will that behavior be recorded and listed in a database that follows the student into adulthood? Watch for the surveys. There will be surveys aplenty asking students questions about their behavior. Determining standards means that someone is deciding what is right and wrong behavior—similar to character education, which may discuss appropriate behavior, but doesn’t write it in stone. If you live in Tennessee, you know how much trouble they have had with online testing this past year. So why are they taking on a new project? I am highly suspect of trying to align behavior to standards. This becomes even more alarming when you consider some of the rigid, “no-excuses” charters, which disregard normal developmental behavior, and demand that children shape-up! Many believe such programs are tantamount to child abuse. Where are the boards and the so-called experts in calling out those schools? Such standards also complement the unfortunate fascination this country has developed with pushing a child to have a certain “growth mindset,” like insisting children have “grit” to overcome their difficulties. No good can come from such over-the-top micromanaging of children. Instead of funding and wasting time on the creation of social-emotional standards, why not look at what could really help children? Instead of wasting money on all the manuals and workbooks—online programs too—why not fund what we all know is needed in our public schools? End high-stakes testing or leave testing up to the teachers and the school. Lower class sizes, especially in K-3rd grade. Support the critical role of community social workers. Create a safe, positive, and joyful school climate. Bring back the arts for ALL children. Make it a state law that all schools provide recess. Bring back a whole curriculum with a variety of subjects to capture a child’s interest. Create after school activities that bring families together with their children. Bring back vocational and career-technical classes. Include classes like home economics where children and teens learn practical skills. Provide schools with more school counselors and nurses. Require all teachers to take college coursework in child and teen psychology. Provide special classes (as temporary as possible) for students who act out or who have emotional difficulties. A lot of what has been done to public schools, in the name of privatization, has been unkind to children. Now, in addition, there is a misguided attempt to form children into what the education reformers think is the perfectly behaved child. But teachers can work on social skills, along with parents, without standardizing them. Also, if people are so weary of Common Core, why add these new standards? Isn’t it time to put Common Core to rest? References you might not be able to access through this post. Blad, Evie. “Social Emotional Learning: States Collaborate to Craft Standards, Policies.” Education Week. August 1, 2016. Benjamin, Harold. “Social-Emotional Learning Would Benefit From Tech Innovations, Repport Says.” Education Week. March, 2016. 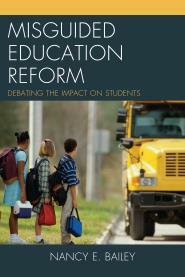 If you want to learn new insight about how we came to this point of losing our public schools, check out my new book. Or, the older one. HERE. *Create a safe, positive, and joyful school climate. *Bring back the arts for ALL children. we would be well on our way to vital school improvement. I agree! Thank you, Dorothy! Attending to the social-emotional needs of each child – good idea. Teaching the Whole Child – good idea. Standardizing these – dystopian idea! How do otherwise intelligent people go from here to there?? Absolutely! Thank you, Jeff for synthesizing! It is scarily dystopian. Teachers are evaluated with standards based instruments. If students are at risk socially/emotionally, will teachers eval suffer? There is already some of that with Charlotte Danielson tool for eval! That’s a troubling question, Susan. Thank you for sharing. I assume you have discussed these concerns with your teacher and principal. Perhaps the teacher can work out a buddy system or some other solution. That said, I sympathize with your portable issues. I taught in one for several years and it was no picnic. You might also see if other parents share your concerns. If so, write a petition and document your problems. Sometimes when a group of parents get together the school district will address the issue. Good luck and let us know how you make out. Nothing says that you can’t home school your child in the evening when you are not at work. However, this may not be the solution. I don’t know all the answers, but have you considered sending your child to a magnet school where the facilities might be better for your child. Have you asked the current school for an accommodation for your autistic child? The ADA mandates that they MUST provide accommodations. Just a few things for you to consider. By the way, the IEP requires your input and approval. Make sure your objections are in writing. Verbalize and write to your school board. Get a lawyer before your child is placed in a dangerous situation that s/he may not be able to navigate. And where does this child go during the school day? Are you assuming that this working parent can afford quality day care for their autistic child? What is this district doing with portable classrooms if they have money for specialized magnates? Lawyer? All parents cannot afford a lawyer not to mention one who specializes in special education law. Unless they have changed the IEP format, the parent signature is for attendance at the meeting. It is no guarantee that they will get everything they deem necessary for their child, unless, of course, they are wealthy and live in a district that cannot afford a lawsuit. Those parents are the only ones who can pretty much count on getting what they want. I worked in both well off and poor districts. Most of the people (both parents and staff) in both types of districts were well meaning and wanted to do the best they could for their special ed students. That meant very different things depending on the district’s resources. I am sorry if I sound a bit snarky. You sound like a parent that has successfully navigated your system which is well resourced. I’m not sure that it is fair to assume that all systems are as well resourced or that all parents have the ability (time and resources) to make sure that their child receives all the appropriate services. I like our local elem. school. It’s one of the best in our county because of it’s small class sizes, more parent involvement activities, and more. People come to our city and want a house some place where their kids can go to this school! They do their 15% off CCSS, which is mainly all Language Arts, which so far, has been fine. I’m not totally happy with it, but it’s alright. Then they teach the kids normal math like I learned when I was little. Science, without the CCSS standards and history (not sure about the history books here yet). My son just entered 3rd grade, so we’ll see how things change. But the kids in this school are doing really well. The teachers actually help the children do their work, even though through CCSS they are told not to and to report it. I still don’t want CCSS anymore, and this stupid social emotional standards is CRAZY! Vote for Trump, get CCSS out of here! Smaller class sizes allow teachers to get to know the children and their families. It’s win win! It is also good for students with disabilities in an inclusion setting. I’m glad you are happy with your school. Thanks for telling us about it, Heather. What is the repercussions of kids who don’t make the SEL “standards”? Will they be labeled? Will they be put into Learning Assistance or SpEd? What if they have had trauma such as a parent dying? Will the kids be further stigmatized for not meeting the benchmark? How well trained are teachers on child development? What about TFA? Will they be given training (in addition to their FIVE WEEK SUMMER COURSE) in assessing students on SEL? Great questions, Susan. It is easy to see SEL standards can be misused. I also find it offensive to teachers and parents. Good teachers have always addressed this, and most parents instill values in their children.. Seems like this could also prove to be an expensive idea. If students are not meeting Social/Emotional standards wouldn’t you have to provide special programs to ensure that they do? More psychologists, counselors, nurses… (not that theses would be a bad thing by themselves, but what a can of worms to open. My own son would have been labeled at one point, but came out of high school valedictorian and Eagle Scout. He had some wonderful teachers along the way as well as supportive family and community. No labels. Let’s save services for those who really need them. Great points! And good for your son! Thank you for sharing your story and thoughts. My son is ASD. His emotional behavior is not that of other children. Will he be penalized because of these additional CCSS requirements? That was my first thought, though others above have also stated other concerns that I have. I do not agree that these are needed. I’m an Arts/Recess mom as well. I have my MAED so I know what teachers go through from field experience, and the CCSS on their side is a nightmare already. The summer courses mentioned above do give an intense immersion on the subjects and are equal to those of a half year of school, but neither prepare you for the sheer social-economic issues that happen in each school. Just within students themselves there are different levels of home life and I know that the child that is hungry, beaten, or neglected will not do as well on the social CCSS as one that is nurtured and given everything that they need. This needs to be seriously examined and then discarded Btw, Hilary is also examining the CCSS and how is works with students so it’s not just a Trump thing. Congress still is involved though in both candidates end results so the decision rests on their shoulders. Write your congressman/woman. Great points! Thanks for sharing. I’d like to hear more information on how the candidates are looking into Common Core though. I have not heard that before. Thanks, Sheila. If they dropped the “incessant testing” it would go a long way to show they care. But why do they have charge of that to begin with? Right? Nancy, my hat is off to you! Thanks, I have quite a few files on CASEL, should you want them. I also just found another American Education Research organization using SEL among their parameters to support ESSA and high stakes assessments. While the article is in-depth, the organization needs all of us fighting federal control and public private meddling, to look into the MANY aspects of ‘research’ in the name of education they are conducting. I will have to spend more time reading your wonderful posts. Thanks for the link, Lynne. I always appreciate your sharing. Social-emotional learning cannot be plugged into that period of the daily schedule when children are not excercising attempts at grit while coerced into Pavlovian based data-driven instruction. Social-emotional learning is not another data point to be checked off of an activity list. Social-emotional learning is a result of democratic learning experience when children have an equal voice in the curricula activities they participate in. Social-emotional learn occurs when emotional drive is released and engagement is not the result of Pavlovian control structures. If the architects of #CCSS are mandating social-emotional learning standards it is because they understand that test driven academic standards fundamentally fragment learning content and experience from childrens time-sensitive needs, interests and desires and are implementing these standards in order to cover their asses. Very good points, Clyde. What I read was that they realized exactly what you are saying. Something was missing from CCSS. Thank you! Compulsory public education is child abuse. Well public schools don’t have to be bad places–good schools serve an educational purpose and bring children together. But certainly some of the school reforms have been pretty bad. Thanks, Jerod. . I hear Pearson has been quietly buying up lots of testing outfits and instruments used by schools to determine services for students. If this is true, and I am sure it is, the reason behin these new social and emotional standards is so Pearson can make even more money. I don’t trust anyone anymore. I don’t doubt that this is the case. Thanks for sharing. Our district surreptitiously rewrote all academic standards in Social Studies and English to incorporate SEL, without any parental knowledge or input. Kids are not “graded” on SEL but every academic subject is now infused with the CASEL strands. Students are not graded by strain, but grades are affected if students don’t delve deeply enough on “self awareness” strands, or demonstrate adequate depth of social awareness strands. Other towns study character development, writing style, writing techniques etc. when reading literature; our students learn about self, and contradictions of adults, and personal beliefs on social values, without parental input. Do you know of any other districts that have done this? The states involved with the SEL standards could have districts who are working on these. Maybe some of those parents or teachers will reply. Please don’t lump in all charter schools. I didn’t have a positive view of charter schools until I began working in one. We have an active and informed Special Education Department with social workers, SLPs and SPED teachers in the classrooms, along with the general ed. teachers. We accept all students including those with ASD, physical disabilities and emotional disorders. As an educator who has worked in private/parochial schools and a homeschool parent, there is more of an emphasis on the social/emotional growth because we have focused so much on the academic that we have created a secondary emphasis on the social/emotional growth. Look at the social/emotional growth model as a means in which to teach students to make informed decisions, interact in a positive manner with their classmates and teachers, realize the consequences and rewards of their actions and accept personal responsibility for these actions. I know that there are many who have an aversion to the CCS. Please don’t demonize them. I (as well as my school) look at them as guidelines to direct instruction. As a matter of fact, these make teaching easier because we can differentiate within the CCS for the individual students/groups in our classroom that still fulfill the benchmarks. I know that the word “benchmarks” and “standards” infuriate people, but look at it as guidelines. We follow guidelines all the time in our daily lives. banks follow guidelines, stores follow guidelines, etc. If you took the time to go to your schools, watch the teachers teach, ask them about the CCS and how it guides their instruction, you might have a different perspective. The CCS also takes into consideration the transience of our population. It is reassuring to a parent who is required to travel to put their child in a school that teaches the same concepts and standards as the previous school. The CCS are guidelines for teaching – not direct lessons to teach. That is left up to the teacher. I also realize that there are some bad schools that are used as examples of the ineffectiveness of charter schools. Please don’t judge us all from that lowered standard. We, as educators, don’t judge all parents by the least effective parents. I almost always note that there are some decent charters when I mention them. But most don’t have the conditions you describe, and, Melissa, you sound like you are pro-privatization. Many parents and teachers don’t agree with you. I also find it unusual you have a full special education department in a charter school. But if everything is so perfect it is lucky for your child but not the many other children that get lousy charters. I write that we should have great public schools in our country that are owned by the people. We don’t need two divided systems competing against each other. So we obviously disagree. But thanks for the comment. I am not pro-privatization. My children attend the local public high school. What I am for is the ability for schools to have funding for any type of school they feel will address the needs of their students. Although I am a teacher in a charter school, I support the work of the NEA. How do you feel about “family schools”? Is this true, are schools (regular ed classrooms), being mandated to use the SEL standards? With the idea to remove students from testing and limiting services; are now regular ed teachers forced to the work of special ed. teachers in a mainstream class? I am being told and mandated to get to incorporate this in my classroom; in a modified form. Is it true that school are implementing the SEL standards in regular classrooms. As teachers, we are now restricted by who can be eligble for service, excluding RT (tier 1)I; which seems to be the plan. Are regular ed teachers forced to do the work of Special Ed.? I am being told that this mandate 9use of SEL standards as a measure for regular ed students as well) will be implemented this year in Il. I am having trouble finding any information about this. The first question asked should not be “must should, or ought these now be measured and mandated” but CAN these now be measured? Since the answer is “No, they can’t be measured” the wise course of action is to not continue with the false concept of “measuring” such things. And emotions most certainly cannot be standardized, adding to the insanity of the SEL proposition. STOP this nonsense before it starts.